Back row: A Norris (Trainer), J Taylor (President), H Stafford, F Barrett, F Erentz, A H Albut (Secretary), W Healey (Director). Middle row: W Draycott, J McNaught, C Jenkyns, W Cartwright. Front row: W Bryant, R Donaldson, H Boyd, M Gillespie and J Cassidy. 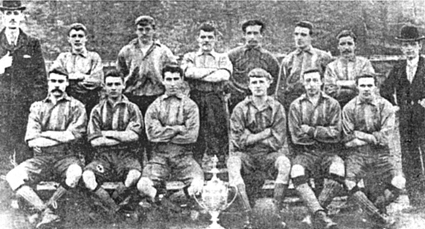 Back row: A Norris (Trainer), H Erentz, F Erentz, F Barrett, H Stafford, W Draycott, J McNaught, W Morgan. Front row: W Cartwright, J Collinson, H Boyd, M Gilespie, W Bryant, J Cassidy.